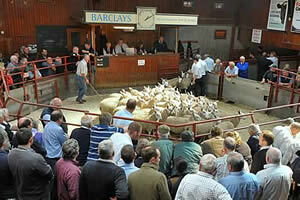 The Cumberland & Dumfriesshire Farmers Mart had forward 5,372 store hoggs, cast rams and ewes at their sale at Longtown on Tuesday 11th January, 2011. A large show with several pens of strong hoggs making over £80 to a top of £87 for Beltex from Woodfoot Farms who sold others at £68.50 and £68. Texels to £82, £78, £77 Gibbs Hill, £78, £77 Waterhouse, £75 Greyside; Charollais £80 Woodfoot, £71.50 Kirkend; Suffolk x £70 Greyside, £69.50 Clerkleap, £67.50 Allerley ; North Country Cheviots £68.50 Kelsocleugh, £67.50 Attonburn; Greyfaces £75, £70 Gibbs Hill, £68.50, £67 Greyside; Bleu de Maines £70 Barkbath; Llynns £79, £76.50, £76 Height; Blackfaces £68.50 Wanwood Hill, £66.50 Penchrise, £66 Gibbs Hill; Swaledales £44.50 Davenport, £43 Highfold, £42 Middle Row; Hill Cheviots £60 Alnham Castle Hill, £59 Attonburn, £57 Alnham Castlehill; Zwartbles £66.50 Bushfield; Herdwicks £35 Middle Row. Cast rams sold to £95 for Texels from Stonehall, £90 Lintongate; Charollais £81.50 Teinside; Cheviots £80 Attonburn, £76 Over Cassock, £75.50 Haystown; Leicesters £89 Stonehall; Blackfaces £71.50 Row, £71 Haystown, £67.50 Blackburn; Zwartbles £66 Duke Street; Swaledales £54 Border Rigg. Cast ewes to £95 for Texels from Lintongate, £90 Duke Street; Suffolks £75 Lintongate; Oxfords £65 Sandholm; Hill Cheviots £60 Sandholm & Alnham Castlehill; Greyface £65 Teinside; Blackfaces £51 Lamperts, £49 Middleknowe; Swaledales £38.50 Stonehall.